Over the past few weeks, we’ve focused FWIW on the slate of candidates on the left considering a bid for the Democratic nomination for president. But, as we all know, a smart campaign needs to know what it’s up against. So for this edition, we dug deep into how Donald Trump’s campaign is using multiple approaches to building its lists and campaign coffers in the final weeks of 2018 – and what that could mean given the Trump White House’s tumultuous week. 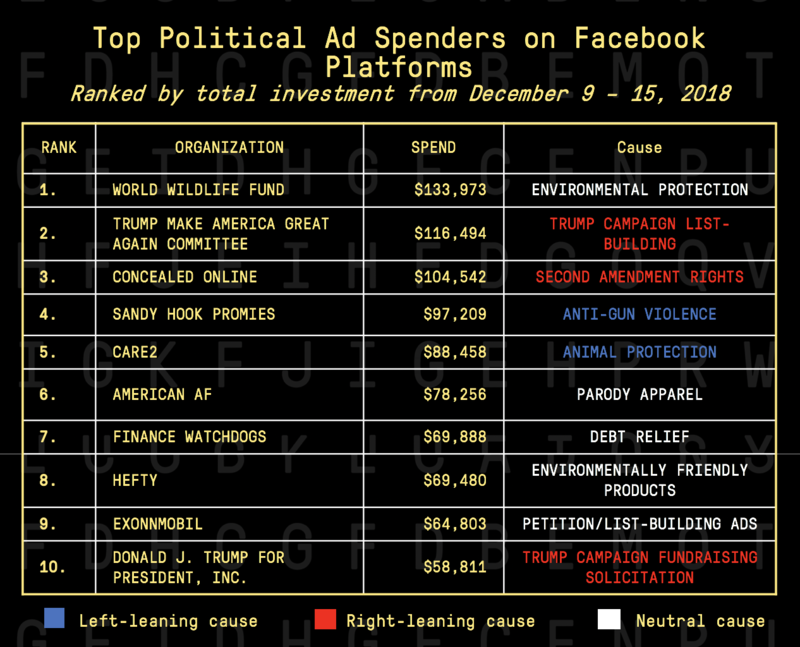 Here’s a list of the top political spenders on Facebook the week of December 9 – 15 and the causes they’re advocating for. This week, we noticed a number of corporations using issues like environmental protection and economic development to build their own lists. 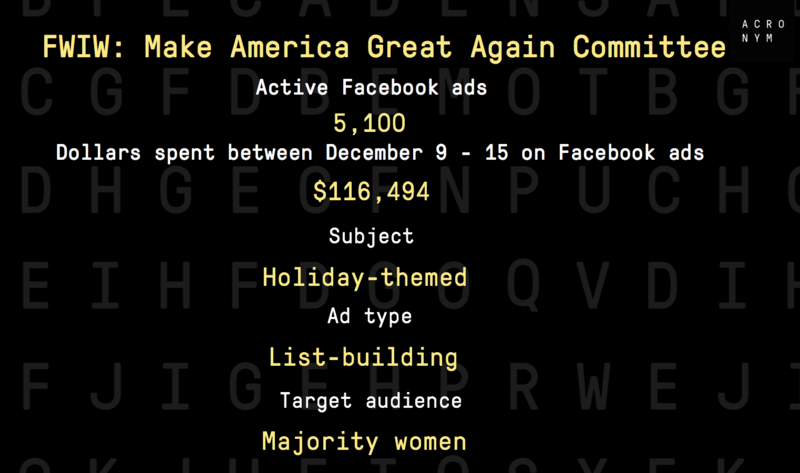 As we looked at the Facebook Ad Archive top spenders this week, we noticed Donald Trump’s name twice on the list. And after digging more deeply, we discovered there’s a reason for that. Donald Trump’s campaign is running ads under two different disclaimers: the Trump Make America Great Again Committee and Donald J. Trump for President, Inc. This disclaimer is running the highest volume of ads for the sitting president and is the campaign’s vehicle for the largest monetary investment in Facebook ads. 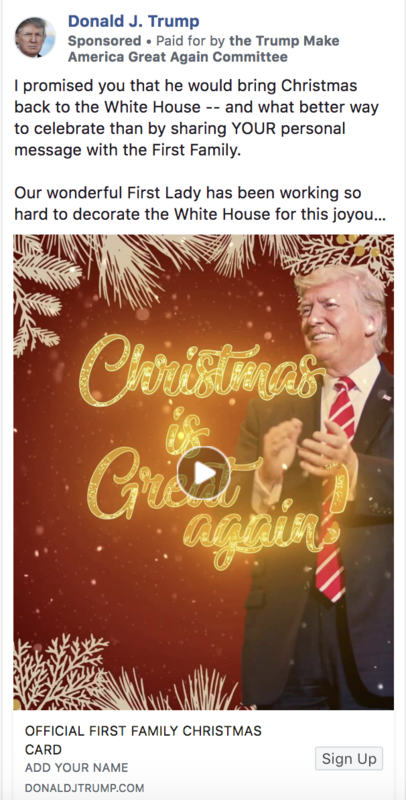 The ads are focused on list-building and acquiring voter data using holiday and family-themed messaging and many of them feature First Lady Melania Trump in the copy or the image of the ad. The tone represents an extreme departure from what voters might be seeing in their news feeds from other sources – like recent news about Syria, the Trump Foundation, or Secretary Mattis’ departure. 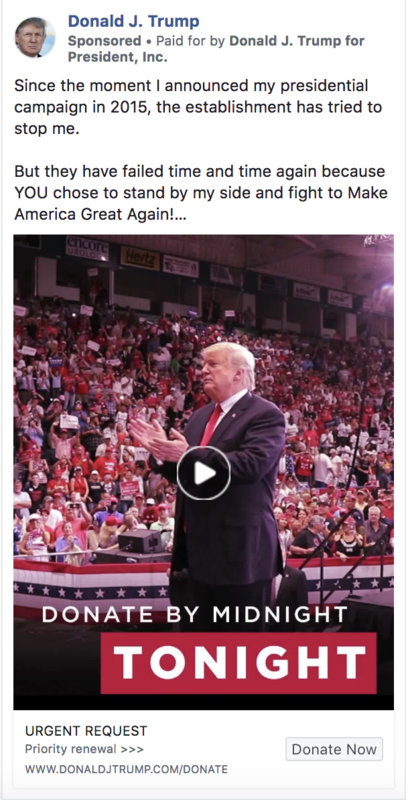 And perhaps signifying an effort to blunt those less favorable narratives in the news about the Trump Administration – we noticed the Trump campaign increased its investment in Facebook ads through this disclaimer by over 50% from last week. 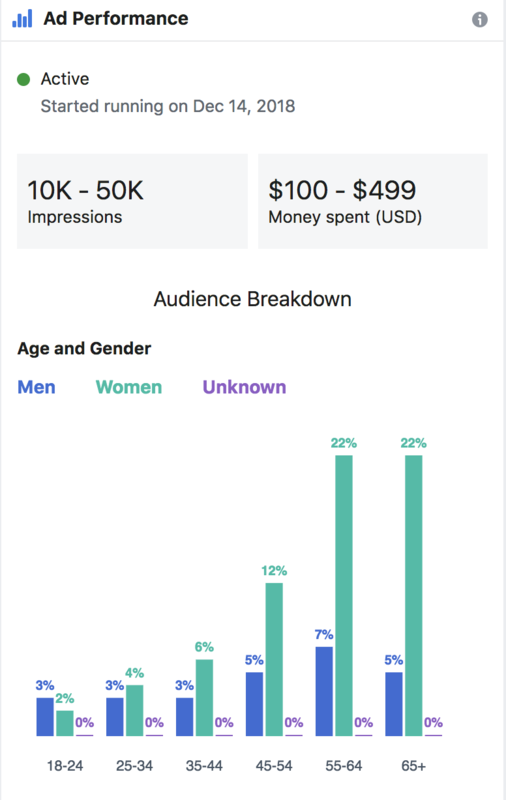 We also noticed that many of the ads (we didn’t go through all 5,100 but we consistently saw this across the ads we looked at) were delivered in a much higher frequency to women. 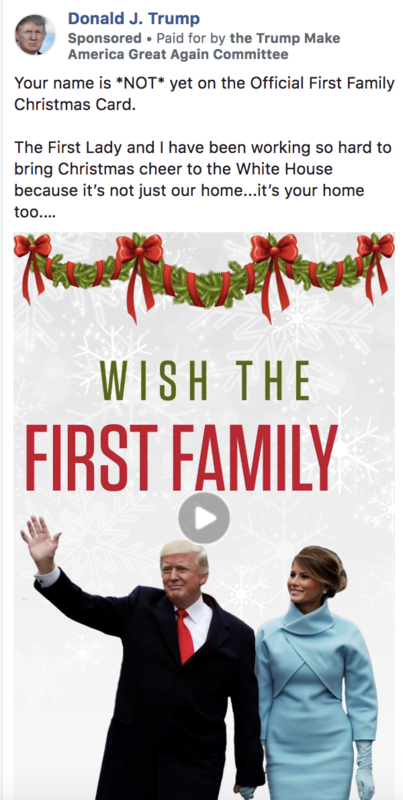 This may indicate why the messaging includes family, holiday, or First Lady themes. And the fact that they’re acquisition ads might suggest Trump is trying to expand his reach and audience among women voters. 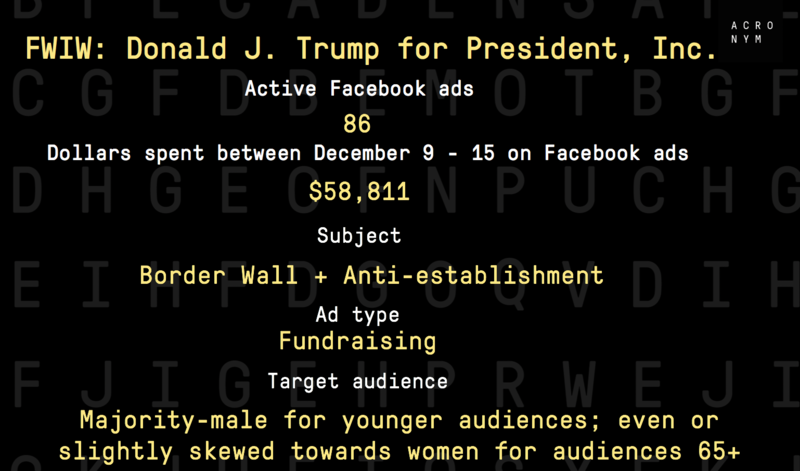 The ads running under the Donald Trump for President, Inc. disclaimer are much more focused on playing to his base – both in tone and in ask. These ads focused on “red meat” issues like border security and used language suggesting that Trump’s opponents are out to get him. With no mention of issues like Syria, Afghanistan, the Trump Foundation, or senior Trump Administration officials’ resignations, the campaign may be trying to create an entirely different narrative among its base – while also energizing it and creating a sense of urgency to encourage more supporters to contribute to Trump’s reelection efforts. 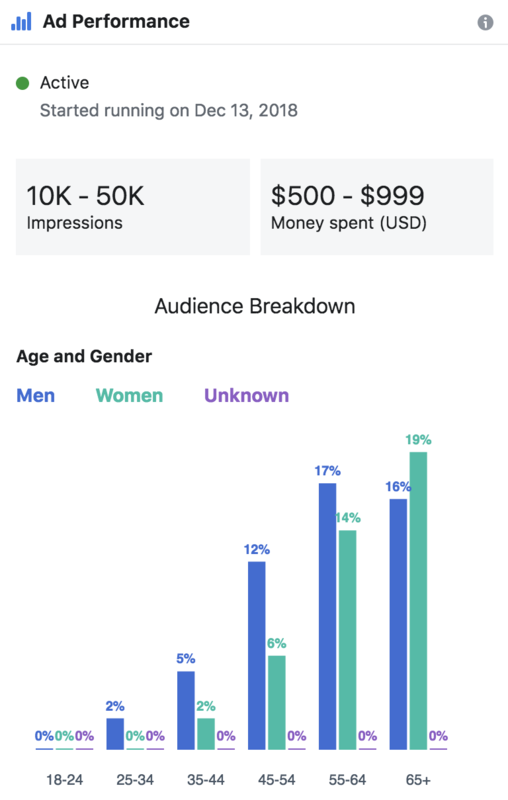 These ads were more even in terms of targets, but skewed majority-male for younger audiences, and switched to majority-female for audiences over 65 years old. This is likely because Trump’s base – whose information his campaign already has (and wouldn’t need to get through acquisition ads such as the ones running under the Make America Great Again Committee disclaimer) – is disproportionately male and older. 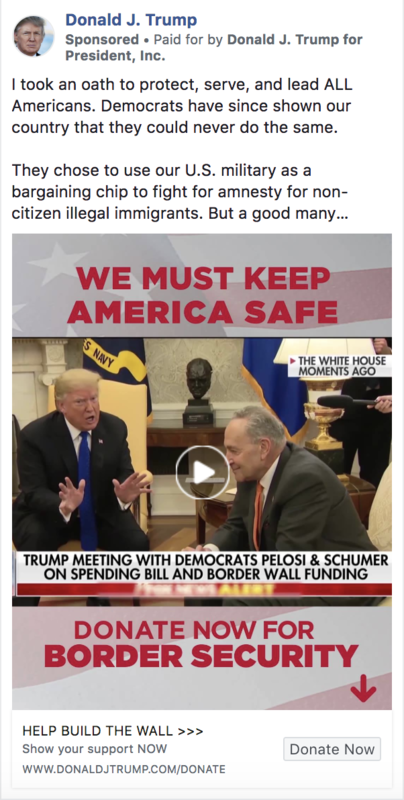 While we have no direct insight into the Trump campaign’s goals for these differing approaches to advertising on Facebook, it’s clear that the narratives they’re trying to create around the President make no mention of the controversies enveloping the more traditional news media this week. And it will be interesting to see whether their strategy can effectively blunt the impact of those stories – both with their base and with voters they’re trying to court. You may not have realized this (we didn’t! ), but there are already official ads for Democratic candidates running for president in 2020. Well, one candidate. 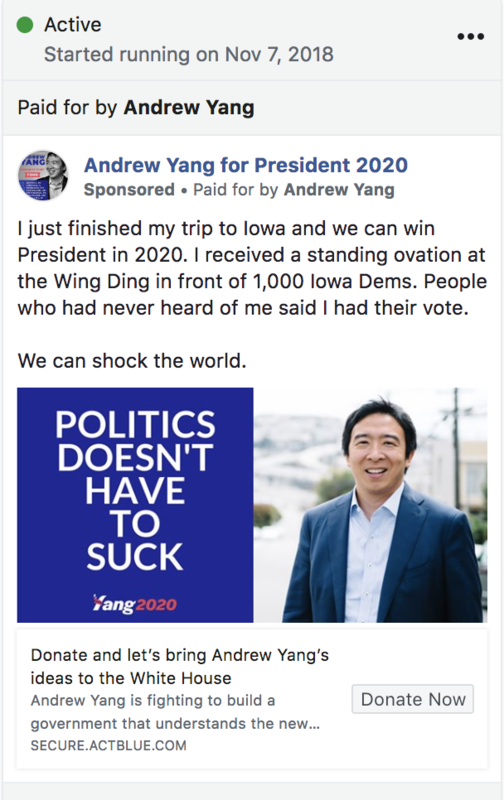 Check out the first Democratic ad of 2020 on Facebook, from entrepreneur Andrew Yang running on a platform advocating for universal basic income. That’s all for this week. We’ll be taking a break for the holidays next week, but we’ll see you in January. In the meantime, make sure to follow us on Twitter and email us with ideas of what you’d like us to dive into next.